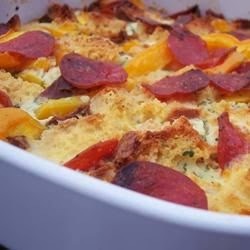 Toss cubed bread with bacon, cheese, and mushrooms, and pour into a 9x13 inch baking dish. Whisk together eggs, half-and-half, and mustard until smooth, then pour evenly over cubed bread. Cover dish with plastic wrap, and refrigerate overnight. Remove plastic wrap from the baking dish, and bake strata in preheated oven until the top is golden brown, and the eggs are set, about 1 hour. Let stand for 10 minutes before serving.